Be the first to share your favorite memory, photo or story of Wally. This memorial page is dedicated for family, friends and future generations to celebrate the life of their loved one. Wally was born on September 23, 1947 in Ironton, MO, to the late Ward A. Sr. and Velma E. Tierney. He grew up and attended school in De Soto, MO and graduated high school in 1965. Wally attended college at Missouri State and graduated in 1976. He met Marsha Noland during his college years and they were united in marriage on August 12, 1978, in Springfield, MO. They were blessed with two children, Katie and Conor. After living in Springfield for a brief time, the Tierney’s moved to Sullivan in 1979 to raise their family. Wally was employed by Ditch Witch, Associate Crafts and then Automatic Fire Control. In 1993, Wally purchased the Automatic Fire Control. Wally is survived by his wife of forty years, Marsha A. (Noland) Tierney of Sullivan; two children, Lauren Kathleen Tierney-Fort and husband, Richard, of O’Fallon, MO, and Conor Noland Tierney and wife, Angela, of Sullivan, MO; one brother, Wade Tierney and wife, Kimberly, of Sullivan, MO; three grandchildren, Rory Tierney, Carmen Fort, and Miles Fort; numerous nieces & nephews, other relatives and friends. 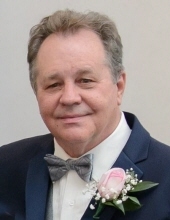 Visitation will be held from 3:00 PM to 8:00 PM, Friday, February 1, 2019 at Grace United Methodist Church in Sullivan. Funeral Services will be conducted 11:00 AM, Saturday, February 2, 2019 at Grace United Methodist Church, with Pastors Nancy Dunlap and Donna Schofield-Dolle officiating. Cremation take place after the service. To send flowers or a remembrance gift to the family of Wally Tierney, please visit our Tribute Store. "Email Address" would like to share the life celebration of Wally Tierney. Click on the "link" to go to share a favorite memory or leave a condolence message for the family.